HOXD9 is the sequence-specific transcription factor which is part of a developmental regulatory system that provides cells with specific positiol identities on the anterior-posterior axis.This gene belongs to the homeobox family of genes. The homeobox genes encode a highly conserved family of transcription factors that play an important role in morphogenesis in all multicellular organisms. Mammals possess four similar homeobox gene clusters, HOXA, HOXB, HOXC and HOXD, located on different chromosomes, consisting of 9 to 11 genes arranged in tandem. This gene is one of several homeobox HOXD genes located at 2q31-2q37 chromosome regions. Deletions that removed the entire HOXD gene cluster or 5' end of this cluster have been associated with severe limb and genital abnormalities. The exact role of this gene has not been determined. Publication Note: This RefSeq record includes a subset of the publications that are available for this gene. Please see the Entrez Gene record to access additiol publications. 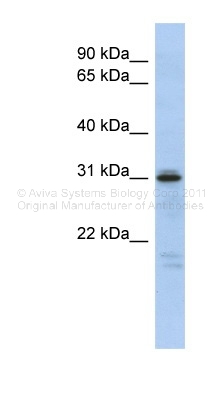 HOXD9 monoclonal antibody (M01), clone 2A9 Western Blot analysis of HOXD9 expression in NIH/3T3 ( Cat # L018V1 ).